HiCaliber Horse Rescue has been asked not to bring its horses to the Valley Center Western Days Parade on Saturday because of concerns some of its horses have a highly contagious equine disease called strangles. The decision was made following a Western Days board meeting Monday night that more than a dozen people attended at the Valley Center library. Most were there to oppose HiCaliber’s participation in the parade. HiCaliber announced on April 21 it was shutting down amid multiple government investigations into allegations of fraud, animal abuse and improper veterinary practices involving the nonprofit. Even so, HiCaliber had planned to have its horses march in Saturday’s parade. She did not elaborate on what that other way would be. But she said if HiCaliber brought horses to the parade, a decision would be made at that time on what action to take. Lisa Burkhard was one of the people who asked the Western Days board to exclude HiCaliber’s horses from participating in the parade. Burkhard, 56, told inewsource she first rode in the parade when she was 7 and has continued over the years to participate. But if HiCaliber horses are part of this year’s event, her horses won’t be. “We don’t believe they’re responsible horse owners,” Burkhard said. The concerns raised by Burkhard and the others at the meeting stem from an inewsource story in March in which former HiCaliber volunteers detailed how strangles was prevalent at the Valley Center ranch, and that it was not being disclosed to anyone outside the organization. Strangles is an upper respiratory equine disease that is highly contagious but manageable if properly contained. The group of former volunteers provided photos, screenshots, internal HiCaliber documents and veterinary records to inewsource and authorities investigating the nonprofit. Chief Steve MacKinnon of the San Diego Humane Society told inewsource Tuesday that investigators have found no evidence of the disease during recent visits to the ranch. “We’ve been in contact with the state vets and with the vets that have been working with HiCaliber, and we haven’t seen any issues right now having to do with strangles,” MacKinnon said. Mike Shore, division chief with the Valley Center Fire Protection District, also told the board that the agency is concerned about sanitary conditions at the HiCaliber ranch. He described “tons and tons and tons” of horse manure on the property. “They have not made any efforts in the last three months to clean that up that we’re aware of,” Shore said. 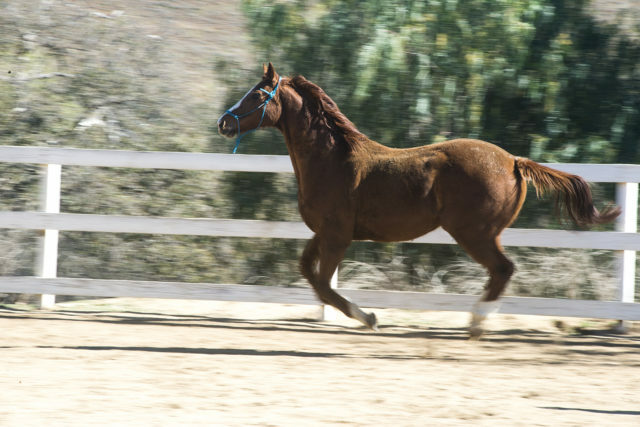 A San Diego County spokesman told inewsource last week that HiCaliber failed to reduce the number of horses on its property to 138 by April 30, as required under a compliance schedule. That resulted in a $100 citation. A follow-up inspection in mid-May found HiCaliber had reduced its numbers to 131, and the nonprofit has until July 30 to cut that number to 113.